39 Things You Didn’t Know About The World’s Favourite Brands #Infographic ~ Visualistan '+g+"
In the consumerist society in which we live today, it is pretty much impossible to avoid certain brands for more than 24 hours. Whether you purchase something, watch television, walk down the street or simply stay in your house, certain mega brands are utterly unavoidable. It’s also fair to say that among then, we have our particular favourite brands. It could be a certain clothing brand, a drink or a car manufacturer. In fact, it is also fair to say that plenty of us are obsessed with certain brands, Apple being one good example. Read this article from the Huffington Post which discusses when people’s Apple obsession goes too far. No matter how well you might think you know a brand, there will almost certainly be some facts and figures about them which will surprise you. 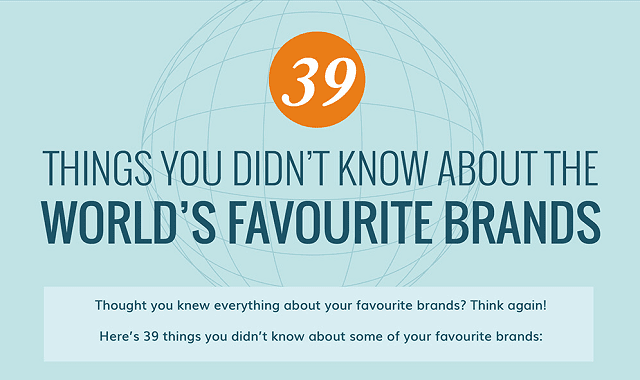 Take a look at this infographic from Silverdoor.co.uk titled ‘39 Things You Didn’t Know About The World’s Favourite Brands’ to find out some staggering facts about your favourite brands.